Special Service Area (SSA) 27 works to make Lakeview a neighborhood where people wish to live, linger and long to return. SSAs are a funding mechanism to raise money for services to a designated mixed-use area through a property tax levy in order to supplement City services. The Lakeview Chamber of Commerce is the Sole Service Provider for SSA 27, which was established in December 2003. It manages SSA-funded programs under the oversight of the SSA 27 Board of Commissioners. For more information about SSAs, please visit the City of Chicago's website. We envision Lakeview as Chicago's most sought after neighborhood. Our mission is to support a vibrant local economy and high quality of life for the benefit of Lakeview businesses and residents by improving and enhancing public streets and spaces, creating memorable experiences, encouraging spending locally and promoting the neighborhood. TJ Walczak, Walczak Hernandez, P.C. Are you interested in becoming a Commissioner? Please contact the Lakeview Chamber of Commerce at 773.472.7171 or email ssa27@lakeviewchamber.com. The Low-Line Committee provides vision and direction for the Low-Line, a one-of-a-kind project that would connect Southport Ave. and Paulina St. with a contiguous, half-mile long walkway and garden beneath the CTA ‘L’ tracks, focusing its efforts on new plazas at Southport, Ashland and Paulina. The Streetscape Committee advances SSA 27’s mission of improving and enhancing public spaces and creating memorable experiences within the service area. The Community Events & Placemaking Grant Program Task Force is responsible for reviewing applications submitted by organizations or individuals who are interested in planning events and public programming within the SSA, and determining whether to fund or provide technical support for projects that meet the SSA’s goals to create memorable experiences and promote the neighborhood. The Lakeview Gift Card Task Force is responsible for evaluating the original goals of the Lakeview Gift Card program and determining whether any changes need to be made to the program. The Task Force will meet at least twice in Spring 2019 to discuss the goals of the SSA’s shopping rewards program, develop and review survey data from participating customers and businesses, and recommend program changes (if any). Unless otherwise stated, all committee meetings take place at the Lakeview Chamber of Commerce, 1409 W. Addison St. in Chicago. All meetings are open to the public. General Contractor - Blake Residential & Commercial Development Co. Unless otherwise specified, SSA 27 Commission meetings are held at Sheil Park, 3505 N. Southport Ave. in Chicago. All meetings are open to the public. 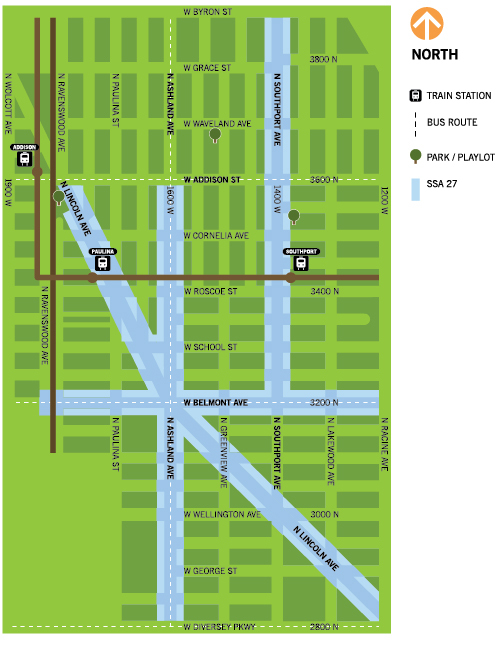 The Low-Line re-envisions the half-mile space beneath the CTA ‘L’ tracks between Southport and Lincoln avenues as an exciting Chicago art destination and a fun and dynamic path connecting Lakeview. The Lakeview Chamber of Commerce, the sole service provider for Special Service Area 27, seeks a qualified commercial tree care or landscaping company to conduct a comprehensive inventory of all street trees located along the public way within our service area and develop a management plan that will be effective for a minimum of three years through at least 2022.